Watch the World Premiere of Brad Paisley's Video 'Old Alabama' Featuring Alabama! 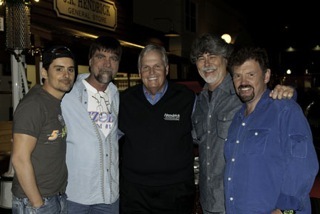 With the single already #2 on airplay charts, the video for “Old Alabama” features NASCAR legends Darrell Waltrip, Jeff Gordon and Rick Hendrick and iconic supergroup Alabama. Paisley and his multi-talented guests contribute to a visual road trip down memory lane as Alabama music videos from the 1980s play in the background as Paisley and Alabama perform. Images of Paisley are digitally composited into the original videos, making for a surprising and hilarious visual. A collection of high energy images of Gordon driving, Waltrip appearances and a special guest appearance by Hendrick capture the spirit and fun of the song. The video was shot on country roads in Charlotte, NC, and several takes took place at Hendrick Motor Sports Complex in Concord, NC. During the 5-6 pm Eastern Time slot, TV viewers can look for Brad Paisley and a special guest from his video to be interviewed on SPEED. During this hour, a portion of the music video of “Old Alabama” will be broadcast. Immediately following the world premiere on SPEED, the online premiere takes place exclusively on the SPEED broadband channel on NASCAR.com and can be streamed throughout the weekend. Prior to the NASCAR Sprint All-Star Race start (9 pm Eastern on SPEED), fans on hand at the speedway will view the music video at approximately 8:50 pm on the world’s largest HD video board.